Pretty to look at but hard to photograph...That's my project for today - Clear Cards. I started out with a 10-1/2" x 5-1/4" piece of Clear Card Stock (Acetate works well too) - scored with my Scor-Pal (folded size 5-1/4" x 5-1/4"). I adhered my Silver card stock (dimensions will be below) to the center backside of my back of my clear card. Adhered my Blue card stock panel in the center of the inside of the back of my card (it's now in the center of my Silver panel) set aside. I stamped my Santa's Sweet Shoppe Image from Starving Artistamps in Black Archival and clear embossed on my white card stock - then stamped again on my Snowflake Paper, cut out the mug and scarf and adhered to my embossed image. I adhered this image to the front outside of my card (centered over the panels already in place), adhered my Silver Panel to the backside of the inside front panel. When the front of the card is closed you'll see all layers lay on top of each other. White Panel 2-1/8" x 2-3/4"
Silver Panel 2-3/8" x 3"
Blue Panel 2-5/8" x 3-1/4"
Silver Panel 2-7/8" x 3-1/2"
To finish my card, I stamped my snowflakes in White Stazon, added some Stickles to my stamped image and snowflakes, stamped my matching sentiment on the inside Blue Panel, and added the Felt Flurries and Rhinestone brad with a glue dot. 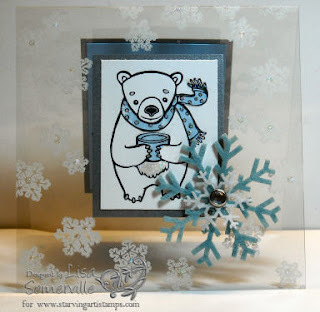 If you haven't joined the Starving Artistamps Group on PaperCraft Planet - be sure to check it out - it's FREE. 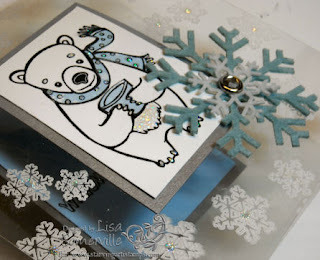 Starving Artistamps is hosting a Clear Card Challenge - see details here! 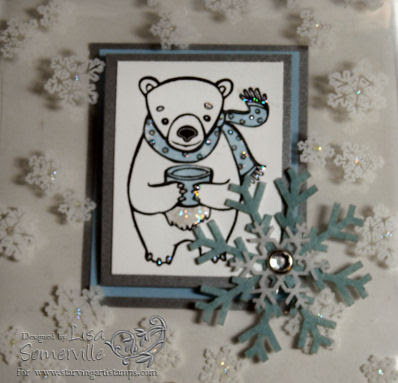 What a sweet and fun card!